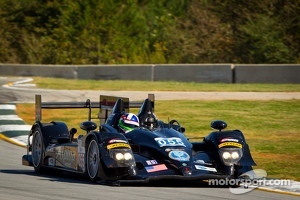 Rebellion Racing came to Petit Le Mans with one goal: To take the overall victory! The FIA World Endurance Championship (WEC) team still has one event left on the 2012 calendar – 6 Hours of Shanghai next weekend in China to lose out their season. At the recent 6 Hours of Fuji in Japan, they wrapped up the LMP1 privateer trophy. 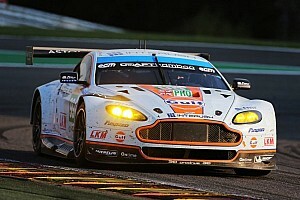 So why take the quick turnaround trip to the USA for the American Le Mans Series (ALMS) season finale at Road Atlanta? For Bart Hayden who manages the European-based team, that question was easy as their goal was to take the victory. After 1,000 miles (9 hours and 37 minutes and 43.578 seconds, Rebellion’s Lola Toyota took the checkered flag for the top step of the overall win. The P1 trio of drivers: Neel Jani, Nicolas Prost, and Andrea Belicchi grabbed their first ALMS win. “We will return next year for Sebring,” promised Hayden. He also indicated coming back for the Petit Le Mans race. Both events are the crown jewels for the ALMS. It was Jani’s first win in the American series and he said, “I think the start was the toughest part of the whole race. It was a big fight with the Muscle Milk car on my tail. He put a lot of pressure on me. A lot of close moments in traffic. They got us in the pit stop, so I thought I will just run my race in traffic and do my speed.” It was a surprised for Jani when Lucas Luhr was no longer in the battle. The newly crowned Muscle Milk Pickett Racing HPD ARX Honda had contact with a slower car and was sidelined for repairs. Prost commented: “The track is very different; you pay the price for any error. The walls are much closer, you go off here and it’s against the wall. The traffic is a bit more than we have in WEC, but in the past Le Mans series it is similar. It is a risk taking thing in the traffic. Success is about how much risk do you want to take, the answer to the question today was not too much.” Prost also now has one ALMS win to his credit. The North American fans will see the team again next year in Austin, Texas for the WEC combined race with the ALMS. Other races here in North America are a possibility depending on the WEC final schedule. For the ALMS P1 teams, today was not a good one to say the least. 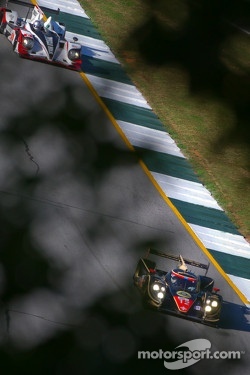 Both of the Dyson Lola Mazda cars had issues that saw them drop back. In fact the top two P2 cars were second and third overall. The P2 fight went down to the wire until the #95 Level 5 Motorsports team had reached their 70% that allowed them to clinch the class championship. Still they were aiming to close out the season with the win. It was close between Level 5 and Conquest Endurance. The battle at times was quite intense: “We have a really good car, first. It does so well in traffic, this race is so special, and it is a mix of being risky and impatient. We saw a lot that it was easy to be in contact and lose the maneuvers and track position. We had a perfect race; Scott did well during his stints. And it was a great team race,” said Bouchut. Unfortunately for the Conquest Endurance team, one of their drivers exceeded the maximum drive time. Per Article 21.2 of events SR, the No. 37 Morgan Nissan has been excluded. Instead of third overall and second in P2, the team lost out in points awarded for the Petit event. Conquest loss was Level 5’s gain. Tucker with two special guest drivers moved up from third to second in P2. IndyCar star Dario Franchitti and his younger hot shoe brother Marino Franchitti were already happy for the P2 title winning team, but now the celebration will include their second place finish. Moving up to third was one of the European Le Mans Series teams. Thiriet by TDS Racing had already notched the ELMS P2 championship by finishing fourth tonight in their #46 Oreca 03 Nissan. However now Pierre Thiriet, Mathias Beche, and Christophe Tinseau have the added bonus of taking third at Road Atlanta. The newly crowned ELMS title winners were in quite a heated battle with the #055 Level 5 P2; the difference at the finish line between what is now 2nd and 3rd was 23 seconds. The GT teams again put up a good fight, and with the addition of the two ELMS teams in their GTE Am title fight, it became even more interesting. 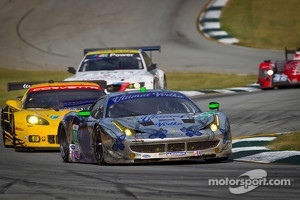 One team stood out, and not just with their new livery on the Ferrari F458 Italia. 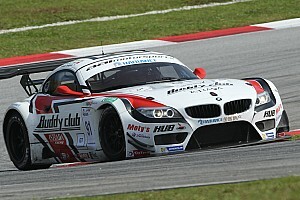 Extreme Speed Motorsports with Scott Sharp and Johannes van Overbeek came prepared to end the season with the victory. 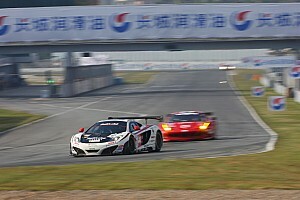 Their third driver Toni Vilander is very familiar with the F458; thus the driver lineup was strong. However, their competition to take the season finale victory also had extra strength with their third drivers. The speed of the GT cars were extremely close, and all it would take was one minor flaw in the pits, or an error on track, or a mechanical failure. For the Patron ESM team it was a near perfect weekend. They had the GT front row until the #02 failed technical inspection. Guy Cosmo just nipped Vilander in the final qualifying minutes; #02 was moved to the back of the grid while the #01 ended up with the pole. Today’s victory for the #01 Ferrari over the Corvettes, BMWs and Porsches was the icing on the Patron ESM’s cake this year. “It started at the beginning of this year. Every event we've gotten better and better. This is our 6th podium. Every race we've been building on the last one. We've had a fast car, the crew executed so well, strategy was spot on. It was a testament that as busy as it was around here and there wasn't a scratch on the car,” said van Overbeek. For Vilander, anytime he races a Ferrari and takes a win is a plus mark in his book. Losing in 2010 due to fuel shortage was on his mind during his final stint. “2010 was on my mind when we ran out of fuel in 10a. My engineer Lee was on the radio most of my last stint. We were out with the fuel mileage, I did everything I could to save fuel, we were so relieved when I went by 10a and knew I had enough fuel. There was a lot of emotion. I've been traveling a lot this year, being away from the family. These are the moments we do it and we do this racing stuff,” he said. Corvette Racing had already notched the drivers’, team and manufacturer titles; but they wanted the Petit victory to close out the year. The #3 C6 ZR1 with drivers Jan Magnussen, Antonio Garcia and Jordan Taylor finished second. One lap down wads their third place BMW Team RLL with Jorg Muller, Bill Auberlen, and Jonathan Summerton in the #55 BMW E92 M3. Graf, Luhr and Pickett Racing: 2012 Champions!